Paddle type level switches are general powder level switches, and are used not detect powders. 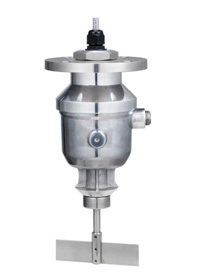 These level switches have been used in various locations where powder and grains must be detected. This page introduces operating principles of paddle type level switches and shows some application examples.If you are saying, We need a level sensor that can measure in our specific conditions, then count on us. We can provide devices that will meet any need, including the following. Install the level sensor at the position where you want to detect the level of the material, and rotate the vane. A small motor rotates the vane. 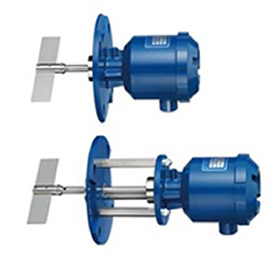 When the material level rises and prevents rotation of the vane, the motor starts turning the detection lever and moves two micro switches. The first switch that moves turns a control circuit on/off. The next switch that moves turns off power to the motor.When the material level drops, the vane is released and the detection lever resumes its position. The motor starts to rotate and becomes ready for another level detection. Paddle type level switches are required to be highly reliable because they are used in harsh environments of powder, grains, and lumps on production lines. In order to meet various requirements of our customers, we routinely improve our paddle type level switches, in order to maintain high reliability, durability, and ease of use. We have a variety of lines to meet customers’ specifications. Is there a level switch that can detect stones and rocks? Our ML-5K paddle type level switch is specially designed to detect lumps. Using a pipe shaft connected with a shackle improves vane and shaft's ability to withstand shocks . So this level switch has sturdy and robust. Therefore this level switch is shock resistant when detecting the level of stones, rocks, and pebbles. I heard that there is a paddle switch that can be hung on a pipe. Do you have such a product? Our paddle type level switch ML-S3X is hung from a tank top on a pipe. This switch is also used to detect powder at a tank bottom if it cannot be connected to the tank top.